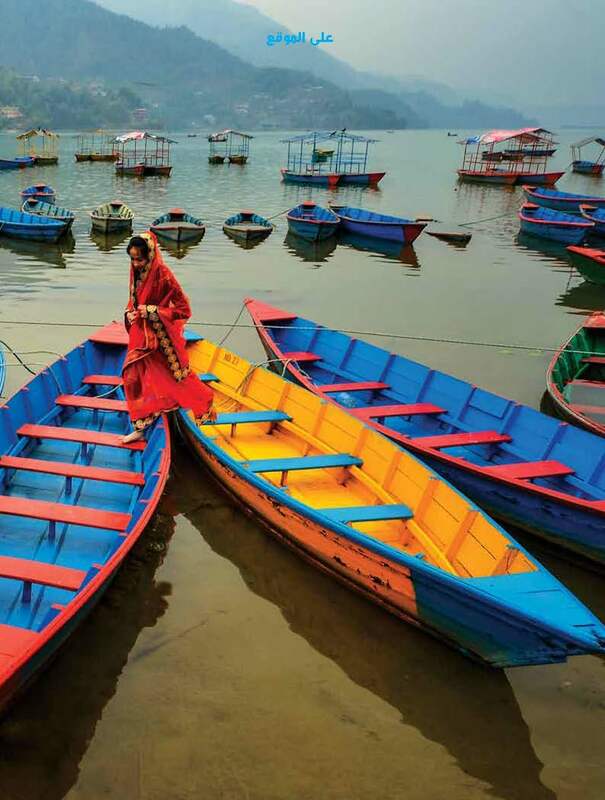 The capital city of Nepal has a mélange of experiences from spiritual to nature and wildlife to food that is sure to cause a sensory overload. The bustling city of Kathmandu is peppered with experiences like no other. What you seek however is what you get so make sure you make the most of your visit to Nepal – the ‘Roof of the World’. 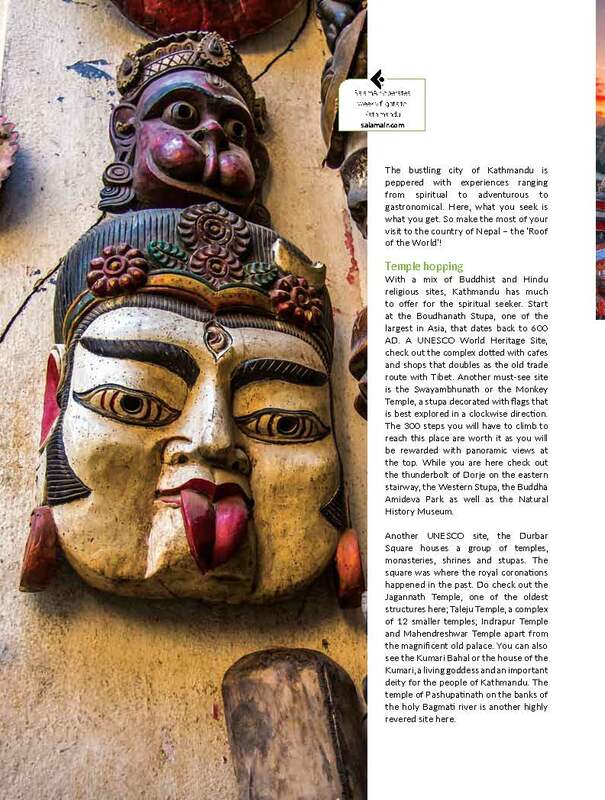 With a mix of Buddhist and Hindu religious sites, Kathmandu offers much for the spiritual seeker. Start at the Boudhanath Stupa one of the largest in Asia that dates back to 600 AD. A UNESCO World Heritage Site, check out the complex that is dotted with cafes and shops and also the old trade route with Tibet. Another must see site is the Swayambhunath or the Monkey Temple a stupa decorated with flags and is best explored in a clockwise direction. The 300 steps to reach this place will reward you with panoramic views that are not to be missed. When you are here check out the thunderbolt of Dorje on the eastern stairway, the Western Stupa, the Buddha Amideva Park as well as the Natural History Museum. Another UNESCO site, the Durbar Square has a group of temples, monasteries, shrines and stupas with several Godmen who hang around here. The square would be the place where royal coronations happened in the past. Do check out the Jagannath Temple one of the oldest structures here, Taleju Temple a complex of 12 smaller temples, Indrapur Temple and Mahendreshwar Temple. You can also see the Kumari Bahal or the house of the Kumari, a living goddess and the most important deity of the people here at the Durbar Square. You can see Kumari in the annual Indra Jatra Festival that is usually in September. The temple of Pashupatinath on the banks of the holy Bagmati River is highly revered site as well. For a tourist a visit to Kathmandu cannot be complete without visiting Thamel where you have a motley mix of restaurants, souvenir stores and more. The main street of the city this is where you will find smell of incense as well as of the momo’s. Some of the best things to buy here are the prayer flags, singing bowls used by Buddhists and pashmina shawls. Just be prepared to strike a bargain so you get a good deal. Thamel is also home to some old buildings so make sure you visit Freak Street or Jochne Marg where you can still see some of them. Also check out the Ason and Mangal Bazaars for more retail therapy. South of Thamel along Tridevi Marg is the neo-classical Garden of Dreams a space that is a green oasis with lily ponds and botanical plants. And when you are in Kathmandu make sure you try the local food as well. 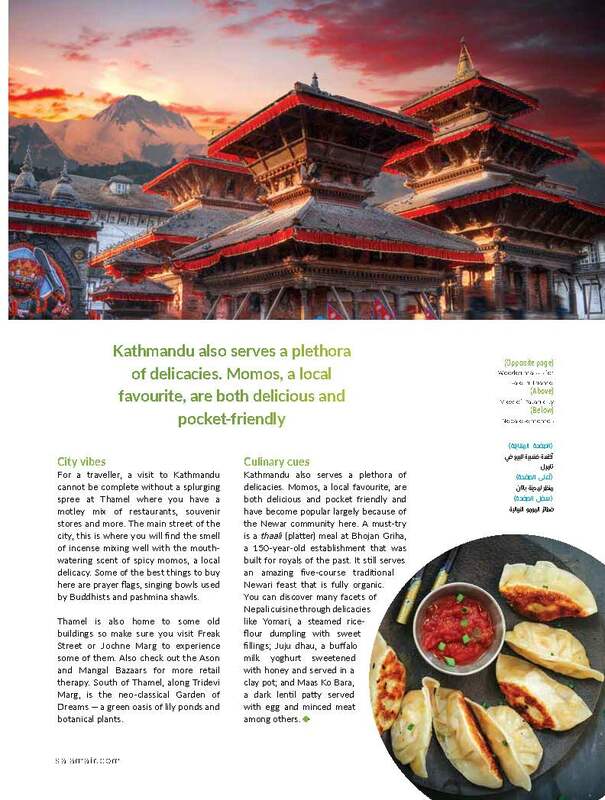 Momos are a Nepalese favourite that is both delicious and pocket friendly and has become popular largely because of the Newar community here. A must try is a thaali meal at Bhojan Griha a 150 year old establishment that was built for past royals that serves an amazing 5-course traditional Newari feast that is fully organic. You can discover the many facets of Nepali cuisine through some delicacies like Yomari, a steamed rice-flour dumpling with sweet fillings, Juju dhau, a buffalo milk yoghurt sweetened with honey and served in a clay pot and Maas Ko Bara a dark lentil patty served with egg and minced meat among others. 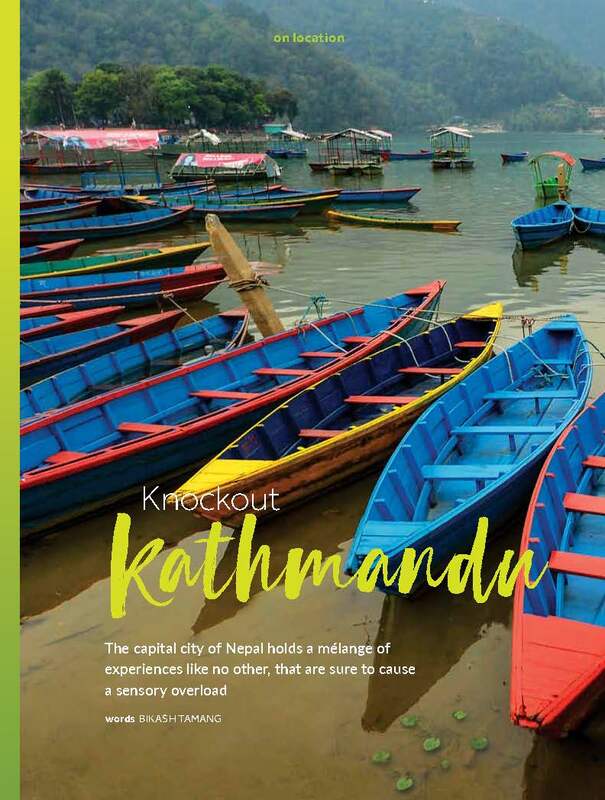 Kathmandu is a great destination that has many surprises that are waiting to be discovered – well after all its good fun to be on ‘top of the world’.